Members of The Church of Jesus Christ of Latter-day Saints (Mormons) consider Joseph Smith, Jr. (1805–1844), the Church's founder, to be a true prophet, in the true biblical sense. The Prophet Joseph, who was ultimately killed by his religious and political foes, is also remembered as a martyr for the cause. On June 25, 1844, Governor Thomas Ford of Illinois told the state militia that Joseph and his brother Hyrum were "dangerous men" (History of the Church, 5:563) and guilty of treason. To answer the demands of the governor, the two brothers went to Carthage, Illinois, to deliver themselves up to the "pretended requirements of the law" (Doctrine and Covenants 135:1). 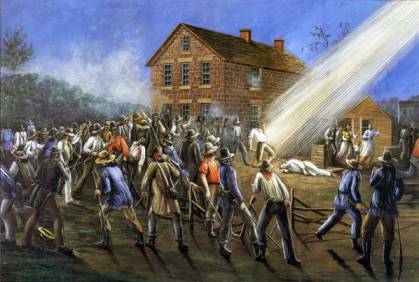 Joseph Smith said of the event, "I am going like a lamb to the slaughter; but I am calm as a summer’s morning; I have a conscience void of offense towards God, and towards all men. I shall die innocent, and it shall be said of me—He was murdered in cold blood" (Doctrine and Covenants 135:4). Joseph and Hyrum were confined in Carthage Jail, along with John Taylor and Willard Richards, members of the Church administrative body known as the Quorum of the Twelve. The four men remained in the jail for two days, during which time they were treated well by the jailers and were visited by friends from Nauvoo. On June 27 a mob, made up of members of the town militia who were in charge of protecting Joseph, overran the jail. The mob, later described by John Taylor as men who were "armed" and "painted black" (Doctrine and Covenants 135:1) entered the room in which the men were being held. The room was located at the top of the stairs, on the second floor of the jail. The mob forced the room's door open and poked their gun barrels into the room. They began shooting into the room, despite efforts by Willard Richards to deflect the gun barrels with his walking stick. Hyrum Smith was shot multiple times and fell dead to the floor. John Taylor also took five balls and was saved when one hit his pocket watch. He sought refuge by rolling under the bed. 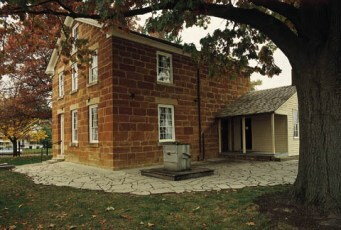 Joseph Smith ran toward the window where he was shot in the back from inside the jail and shot in the chest from outside the jail. He either fell or leaped out of the window, landing on the ground near the well outside the jail, where he was again shot by members of the mob. (See History of the Church, 6:602-618, also Doctrine and Covenants Student Manual, 348). "Joseph Smith, the Prophet and Seer of the Lord, has done more, save Jesus only, for the salvation of men in this world, than any other man that ever lived in it. In the short space of twenty years, he has brought forth the Book of Mormon, which he translated by the gift and power of God, and has been the means of publishing it on two continents; has sent the fullness of the everlasting gospel, which it contained, to the four quarters of the earth; has brought forth the revelations and commandments which compose this book of Doctrine and Covenants, and many other wise documents and instructions for the benefit of the children of men; gathered many thousands of the Latter-day Saints, founded a great city, and left a fame and name that cannot be slain. He lived great, and he died great in the eyes of God and his people; and like most of the Lord’s anointed in ancient times, has sealed his mission and his works with his own blood; and so has his brother Hyrum" (Doctrine and Covenants 135:3). Mormons believe that Joseph Smith was a prophet and "testator," meaning he "provided to mankind a witness of God’s covenants." When Joseph Smith died, his death "place[d] a seal of truth on the testament" (Doctrine and Covenants Student Manual, 350). Joseph Smith, Jr. gave his life to the cause of building The Church of Jesus Christ of Latter-day Saints, which Latter-day Saints believe restored the true Gospel of Jesus Christ to the earth. Mormons today "look to the Prophet with reverence because of what he did for their understanding of Jesus Christ and His mission" (Doctrine and Covenants Student Manual, 349). This page was last edited on 23 June 2011, at 15:08.